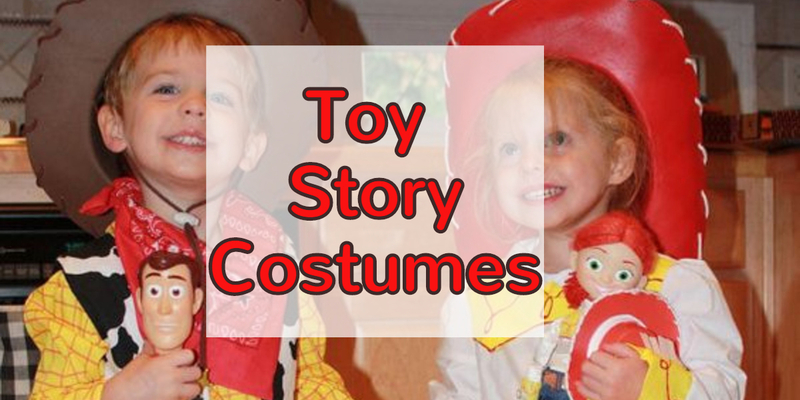 Let’s take a look at some super cute Toy Story costumes for toddlers, kids, AND adults. Ok, I admit it, I borrowed my granddaughter one hot summer afternoon so I could get away with seeing the latest Toy Story Movie, Toy Story 3. If you haven’t yet seen the movie, I highly recommend it. Borrow a kid if you have to, or rent the DVD and watch it at home with your kids and grandkids (or even alone!). Toy Story 3 is one movie that’s just as enjoyable to adults as it is children. It’s also one of those rare movies where the sequels are just as good as the original. In fact, the release of Toy Story 3 has sparked new interest in the various Toy Story characters as Halloween costumes. 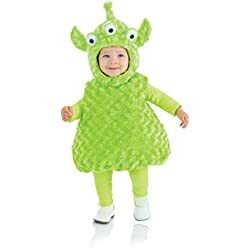 If you’re looking for a Toy Story Halloween Costume this year, you’ve got lots of fantastic choices – Buzz Lightyear, Woody, Jessie, Mr. and Mrs. Potatohead, Rex the dinosaur, Hamm the piggy bank, Alien Men, Green Army Men, and even Little Bo Peep! Here are some Buying Tips and Helpful Hints for picking out just the right costume for you. Not too surprisingly, the most popular choice for men and boys is Buzz Lightyear. 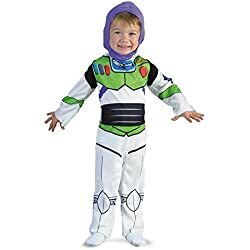 The Buzz Lightyear costume is available in adult, child, and toddler, as well as chubby for boys and plus size for men. The standard costume comes with a jumpsuit and headpiece. There are various deluxe versions that come with the jetpack, gloves and leg guards. You can also buy those and other accessories separately, including a space helmet. 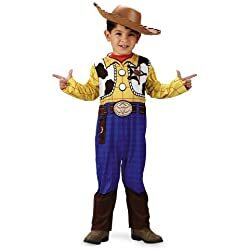 The second most popular choice for men and boys in the Toy Story Halloween costume line is the Woody sheriff costume. 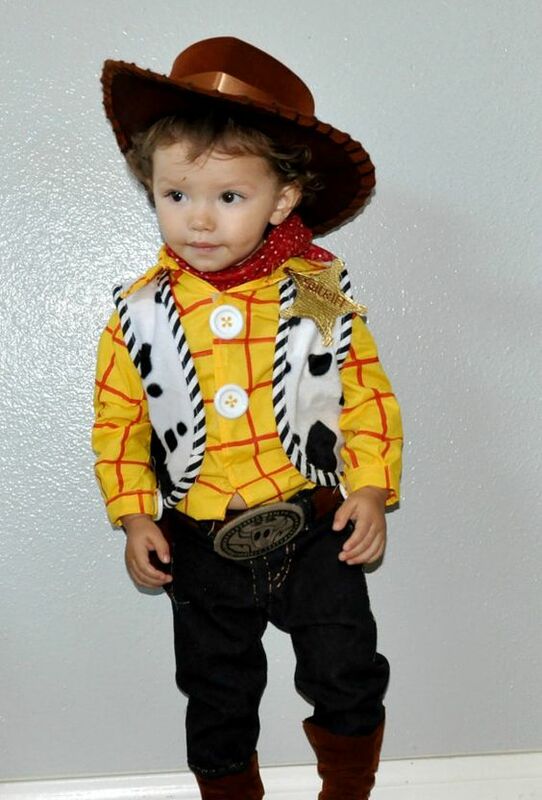 Woody is the classic cowboy but with a distinctive look that only a Sheriff can have! The official costume comes in adults, child and toddlers. The standard version comes with the detailed jumpsuit and cowboy hat, and the deluxe versions add some extra details. 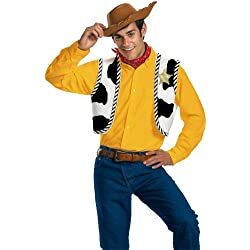 Here’s a neat idea: add a chord to your back that people can pull to make Woody talk! Jessie, the quintessential cowgirl, is the most popular choice for women and girls. 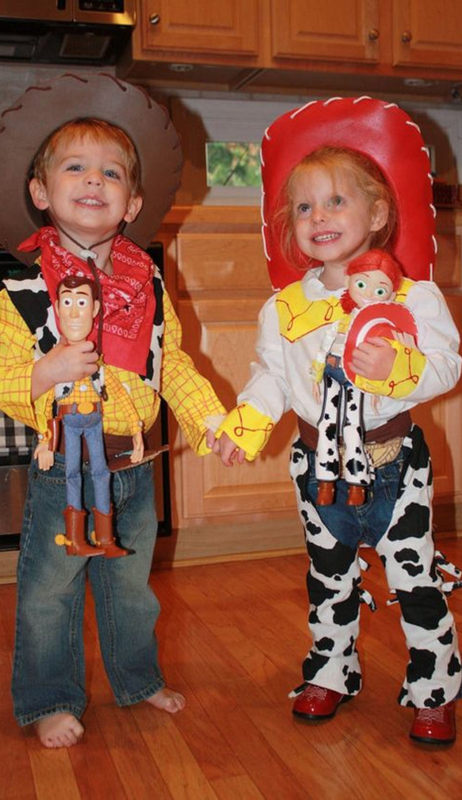 Jessie and Woody also make a great couple’s costume idea. 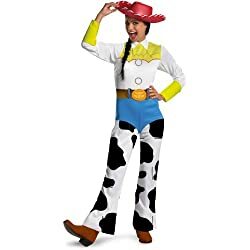 The Jessie costume includes bodysuit and red cowboy hat, and some versions come with the hair bows. To complete the outfit, add a lasso, some cowgirl boots, and maybe even a red wig. The costume is available for both adults and children. New this year, 3 eyes and all! The Alien Men (think…the Claw) saved the day in Toy Story 3, so they jumped up a notch in popularity and now have an official costume! Available in child and toddler sizes, or an adult headpiece. Being a Green Army Man is too cool because you get to paint your face and hands green! The official costume comes in adult and child sizes, and comes with jumpsuit, helmet, hood and boot covers. Rex, everybody’s favorite lovable dinosaur, comes with shirt, gloves, tail and headpiece. Adults can get just the headpiece, and then paint their hands green or get some green gloves. 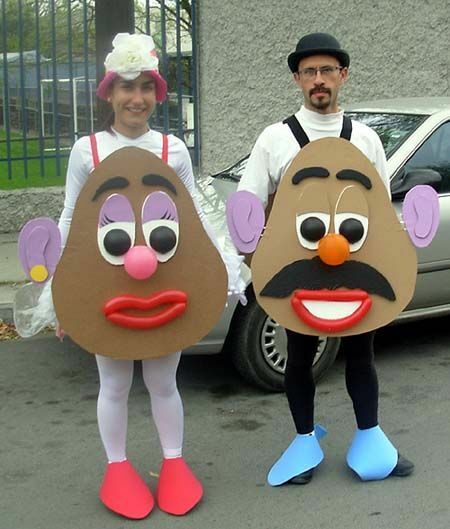 New this year, these spud costumes are just awesome! 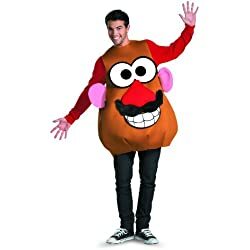 Get the Mr. and Mrs. Potatohead costumes together for the perfect couples Halloween costume for adults as well as children and toddlers! Finally the good folks who design costumes have released a Hamm costume to represent all those pink piggy banks from long ago! This outfit is perfect for girls since it’s pink, but since Hamm was a male in the movie, it’s appropriate for little boys as well. Bo Peep is just so frilly and precious, and little girls will love dressing up as her. The costume includes dress, bloomers, hat and even the staff. Match Bo Peep up with either Woody or Hamm for the perfect twosome! Ok, now that you know your Toy Story Halloween Costume choices, here is another major decision you need to make, if you haven’t done so already. Should You Buy Your Toy Story Costume Offline or Online? Well, speaking for myself, I already purchase most items online, including Halloween Costumes. It’s just so much easier to shop online, and the choices are so much more plentiful. The thought of trudging through the stores looking for the right costume makes my skin crawl! Let’s face it, if you go to your local department store looking for just the right costume, there’s a very good chance that you won’t find just what you are looking for. And, even if you do find that the store carries your favorite character, there’s a good chance they won’t have the size you need. You might be looking for an Adult Size costume and find mostly Child Size costumes in the brick and mortar stores. Or you might be looking for Newborn, Toddler or even Plus Size. Your chances of finding all of the various sizes is much better if you do your shopping online. 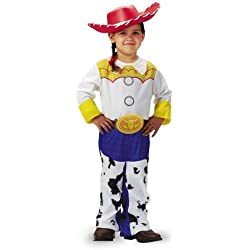 In fact, when it comes to looking for a Toy Story Halloween Costume, you will probably have a hard time finding anything other than Child Size in most offline retail stores. I know because I have looked around a little myself just to see what is available. Of course, some of the larger cities now have brick & mortar Halloween stores. In my own city, there are two Halloween stores that both opened just recently. That’s something you didn’t even see just a couple of years ago…that’s how popular Halloween is these days! So, if you live in a big city, you could do a search online, or ask around to see if there are any such stores nearby. 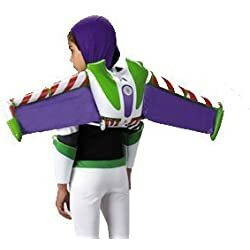 Even so, you will still be hard-pressed to find a bigger, better selection of the Toy Story Halloween Costume line in any brick and mortar store than you will find online. That’s because when you make your purchase online, your costume is coming directly from a huge warehouse where they can store millions of costumes, as opposed to a retail store where they only have a certain amount of space to display and store Halloween costumes. Many online stores now also have a rating system where they show comments left by other shoppers. This gives you the chance to see if other people were satisfied with their purchase, and they will many times comment on the quality (or lack thereof) of the item you’re interested in buying. This will help you determine whether or not the costume is well made, etc., and is a HUGE plus when shopping online. In fact, it’s one of the things I look for when I shop online, and you should too. 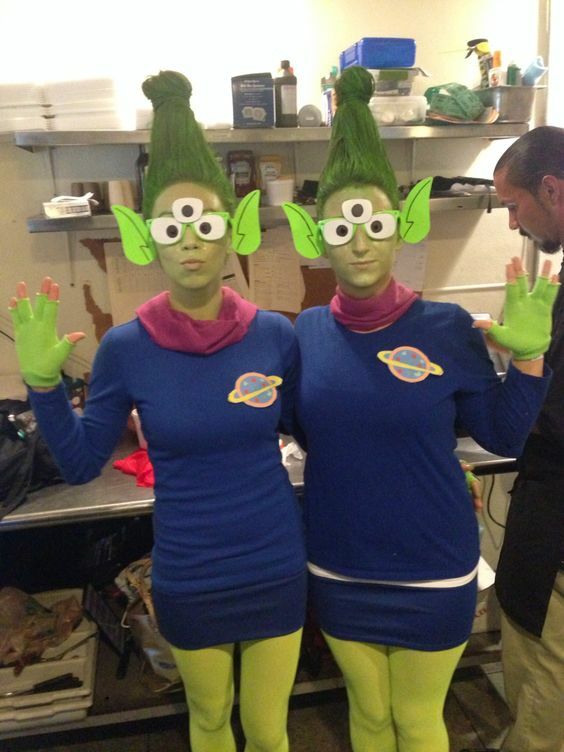 This entry was posted in adult costumes, baby/toddler costumes, Halloween, kids costumes. Bookmark the permalink.